You might not think of your spleen that much, but it's been looking out for you. If you don't have one, there are some things to know to keep yourself safe from infections. What Does Your Spleen Do? In general, your spleen, a flat 4-inch organ located on the left side of your rib cage, is a part of your blood system and immune system. It helps maintain order for your red blood cells and white blood cells. In other words, it works as a blood filter. It removes old red blood cells and holds on to a reserve of other red blood cells to release in an emergency, plus it helps recycle iron. Another function: your spleen can make antibodies to remove bacteria and any other cells that become coated in antibodies. This last bit helps keep our bodies free from pathogens. Logically, if we don't have this organ, we're more vulnerable to bacteria, especially one special type of bacteria called encapsulated bacteria because they have a special carbohydrate (specifically a polysaccharide) capsule surrounding them. How could you lose your spleen, though? Trauma: The most common reason for having your spleen removed surgically is trauma. This is usually due to car and motorcycle accidents as well as falls, fights, and sports injuries. The spleen is the most commonly injured organ in blunt abdominal trauma (1 in 4 cases of such injury affect the spleen). In car accidents, such injuries can also be associated with the incorrect placement and use of a seatbelt. There can also be cases of stabbings and gunshots that can injure the spleen but this less common. Not all damage to the spleen requires surgery. Surgeons will often watch to see how the person and damage progresses, if it is not an emergency, before deciding to go to surgery. Sickle Cell: Autosplenectomy happens in sickle cell disease. In the U.S., 100,000 people have sickle cell. Around the world, over a million do. There are different types of Sickle Cell. The differences in these types depend on which genetic mutations are present. The loss of the spleen occurs most commonly in the most common type of Sickle Cell: Hemoglobin SS disease. Hemoglobin SS disease results from having two copies of the same hemoglobin S gene mutation. In this type, people usually lose their spleen by a process called "autosplenectomy." There have been rare cases of other diseases causing the same process. Treatment of another disease, like an autoimmune disease: Others have had their spleens removed to manage an illness, especially an autoimmune illness. Splenectomy is used to treat one rare disease in particular —immune thrombocytopenic purpura (ITP). In this disease, the immune system unfortunately attacks platelets. This means our bodies don't have one of the tools they need for clotting to stop bleeding. Those affected by the immune system going awry like this may have bruises and bleed easily. They may also have pinpoint red spots on their legs. This disease can go away on its own, but some need medications. If it doesn't go away and the medications aren't enough, sometimes removing the spleen is the intervention that helps. There are other disorders which also may be treated with splenectomy. Sometimes splenectomy is needed because someone has anemia (low red cell counts) due to the destruction of their red blood cells. This can be due to a number of different disorders like hereditary spherocytosis or autoimmune hemolytic anemia (AIHA). Splenectomy can sometimes, but not always, stop the breakdown of red blood cells when medications or other treatments do not work. There are other reasons for splenectomy as well. Although less common, some have had splenectomies to treat thalassemia as well as thrombotic thrombocytopenic purpura (TTP). Sometimes splenectomies were done because a spleen had become too large from another disease. It was also carried out at times to stage a diagnosis of Hodgkin's lymphoma in order to decide the best treatment for the cancer. About 22,000 people lose their spleen through surgery each year in the U.S. The surgery to remove your spleen is called a splenectomy. In the U.S., it is usually done with laproscopically (with a camera and a few very small incisions). If you're healthy, you could leave the hospital on the same day and be fully recovered in two weeks. People who have no spleens are more likely to get sick from certain types of bacteria, particularly encapsulated bacteria (bacteria that have an outer carbohydrate covering). You should be vaccinated before you have surgery, if it is planned surgery. Many splenectomies are performed as emergencies after trauma and so advanced planning is not always possible. If possible, you should have the vaccines two weeks before a planned surgery. If you had emergency surgery and couldn't be vaccinated beforehand (or the vaccinations were not done before surgery for another reason), you should be vaccinated afterwards. The vaccines should be given two weeks or more after surgery, but don't wait too long. You should also be vaccinated against all of the diseases you'd normally be vaccinated against, like measles, mumps, rubella, varicella, and tetanus. You should also talk to your doctor or other medical professional about whether you need to be revaccinated or need a different version of one of these vaccines. Neisseria meningitidis (N. meningitidis): This is the bacteria that can cause meningitis and/or sepsis. The main vaccine is quadrivalent. That is to say; it protects against four strains of N. meningitidis (Serogroups A, C, W-135, and Y). It leaves B uncovered if not specifically vaccinated for. Serogroup X is less common and does not yet have a vaccine available. H. influenzae type b (Hib): This bacteria used to be the top cause of bacterial meningitis in kids under 5 until the vaccine started to be used. It also causes pneumonia and throat swelling and infections that can be serious. It's largely an infection in children, but anyone without a spleen should be vaccinated. Streptococcus pneumoniae (Strep pneumo): There are many types of Strep pneumo, as it is often called. Which strain you're protected against depends on which vaccine you receive. PCV 7 protects against 7 strains; PCV 13 against 13; The polysaccharide vaccine PPSV23 protected against 23 but the immune response was not a strong and protective. Influenza: You'll need to get the influenza vaccine every year. It is to protect you from the secondary bacterial infections, like those that cause pneumonia, which you're at risk for if you get sick with the flu. Many who die from influenza also die from a bacterial infection that attacks when the lung's immune defenses are breeched and exhausted by influenza. Are There Risks to Worry About When Traveling? If you're traveling you may encounter bugs you wouldn't otherwise. You may also live somewhere that has different bugs than other places do. There are particular infections that you may be at more risk for. If traveling in West Africa, be sure to be vaccinated against meningococcal meningitis and that the vaccines is up to date. (Vaccine protection doesn't always last as long as we'd like). Likewise, the pneumococcal vaccine does not cover all strains and you may be exposed to a different strain when you're away. You also may be at more risk for a serious case of malaria if you don't have a spleen. Be sure to have malaria prophylaxis if traveling where you might be at risk and be extra careful to avoid mosquitoes. Likewise, if you live or travel to areas where Babesia is found, you would be at greater risk as well if you had no spleen. This would especially be on Nantucket or Martha's Vineyard in Massachusetts, but also Block Island off Rhode Island and Shelter Island, Fire Island, and eastern Long Island—all part of New York State. The parasite can also occur in other parts of these states and in other areas of the Northeast and the upper Midwest, including New Jersey, Wisconsin, and Minnesota. There are also rare (and serious) cases from Europe. Babesia can in rare cases also be transmitted by a blood transfusion. Also, some without a spleen may be more prone to having a deep vein thrombosis or another clot when they travel on a long plane flight or ride. If you're going to fly, talk to your doctor or other health professional about this disorder and any risks you may face. You should talk to your doctor or medical professional about how to handle your day to day health as well. Some people without a spleen, especially children, take particular antibiotics daily at their doctor's request. The pros and cons of this should be discussed with your doctor or other health professional. Taking antibiotics regularly can have unintended consequences. You can develop antibiotic resistance or get infections that occur when our regular old bacteria are wiped out and left unchecked, so it's important to talk to a medical professional about this. Others carry antibiotics with them which they take immediately if they develop a fever or become sick. They then seek medical care immediately. Immediate treatment can help prevent an infection from becoming a deadly sepsis. Another risk for serious infection comes from a bacteria called Capnocytophagia. It's a rare cause of infections in people with spleens but can be a very serious infection in someone without a spleen. It is usually due to a dog bite, though occasionally cat bites as well. Symptoms begin usually in one day, so you should be prepared in case of a dog bite to seek medical attention (and potentially take antibiotics like penicillin and other common antibiotics that can treat the infection). How Do People Do in the Long Run? Scientists looked back at the soldiers who lost their spleens in World War II. They found that of the 740 American servicemen tracked that many lived long lives. However, they did have increased mortality due to pneumonia (possibly Strep pneumo infections) and ischemic heart disease (heart attacks, possibly because removing their spleens affected their blood system and caused them to clot more, which is a known non-infectious side effect). What If You Have a Big Spleen? 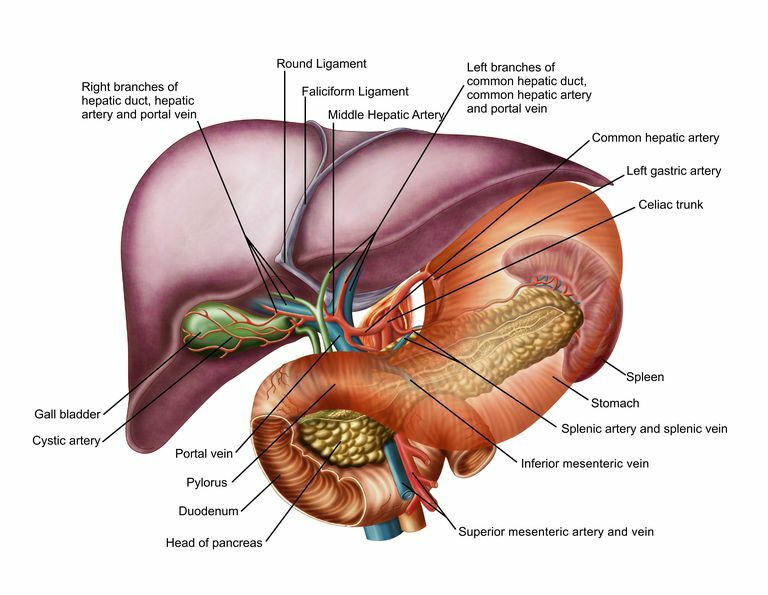 Having a big spleen is called splenomegaly. It's something a doctor or another medical professional should check out. There are many reasons why a spleen might get big. One of the most common is mono (mononucleosis caused by EBV, the Epstein Barr Virus). There are those who have large spleens due to blood conditions they were born with, like thalassemia or sarcoid. Others have a large spleen because of lymphoma or leukemia (blood cancer) or a hemolytic anemia (where red blood cells are destroyed). Others develop it from having liver disease (like portal hypertension). Can You Have More Than One Spleen? Actually, yes. Some people have more than one spleen. Some are born with polysplenia (or multiple spleens) which may be related to other congenital conditions (or medical problems at birth). Others end up with a little bit of their spleen separated from the rest; this is often an "accessory spleen" that results from trauma (including from surgery, even from a splenectomy). Robinette CD, Fraumeni JF. Splenectomy and subsequent mortality in veterans of the 1939-45 war. Lancet. 1977;2(8029):127-9. Watters JM, Sambasivan CN, Zink K, et al. Splenectomy leads to a persistent hypercoagulable state after trauma. Am J Surg. 2010;199(5):646-51. Halpert B, Alden ZA. Accessory spleens in or at the tail of the pancreas: a survey of 2,700 additional necropsies. Arch Pathol. 1964;77:652–654.